Important Information Home Owners should know about Termites. Think you may have found Termites or Termite Damage in Brisbane? Whatever you do, don’t panic about it. Here you can get advice, anytime, day or night or upload a photo of what you’ve found and we’ll try our best to identify it for you. Once a termite infestation has been identified and confirmed, we’ll show you how to stop the Termite problem quickly and prevent it from recurring. Our termite treatments are designed specifically for your needs. 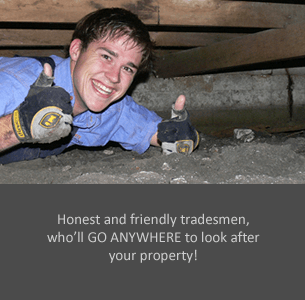 All of the inspectors at Termite Guys Brisbane are honest, trustworthy and reliable and they won’t try and sell you something you won’t need. 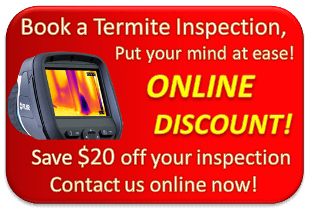 Click HERE to book a Free Quote at your home or to upload a photo for the Termite Guys to check. STEP 1: How to eradicate termites. It’s best not to disturb or spray termites if you find them in your home. This will only kill a very small portion of the termite colony. Termidor is the world’s leading termite control product and it’s our first choice if termites have been found in your home. Termidor dust has a unique ‘transfer effect’ and spreads through the colony to kill the nest. It’s our best chance to eliminate the termite nest, if the nest cannot be found. This method is fast, effective and much safer than arsenic and other toxic pesticides! We can provide this Termite Treatment in Brisbane today! 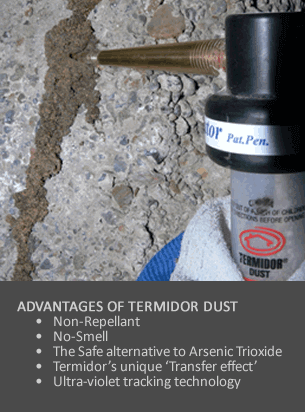 STEP 2: Protect your home with Termidor. Termidor is then applied to the soil around your home to create a continuous termite barrier which is undetectable to termites. A Termidor treatment around a medium to large home can usually be carried out in one day and can protect the home for a period of 8 years. Why is Termidor so effective? Termites travel below the ground looking for food. They’ll even travel under concrete paths until they come into contact with Termidor treated soil. The termites unknowingly pick up Termidor on their bodies and begin spreading it on to other termites in the colony. 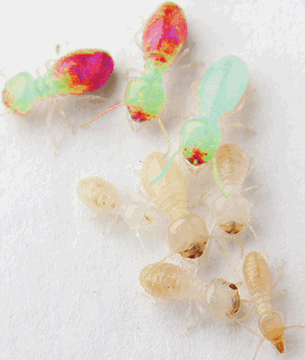 These secondarily affected termites also pass Termidor on through feeding or contact. This process is called the ‘Transfer Effect’. 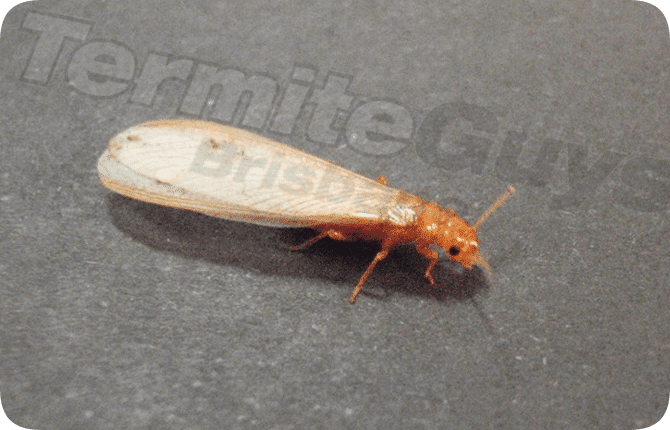 Why choose Termite Guys Brisbane for your Termite Treatment? Termite Guys Brisbane will design a Termite Protection system specifically for your home to provide you with the best options available. Our goal is to provide you affordable, effective, long-term termite protection in Brisbane. Termite Treatments with Rock Solid Warranties. Thermal imaging technology for extra peace of mind. Friendly and ethical – Guaranteed! Termite Guys staff are insured, qualified and experienced in all aspects of Termite Control. We will take the time to solve your termite problem to the end. Ask a TERMITE GUY for advice.